Music By – Erran Baron Cohen. Tagline - The heroic story of a dictator who risks his life to ensure that democracy would never come to the country he so lovingly oppressed. The Dictator is the 4th movie of British Actor Sacha Baron Cohen who has once again never ceased to tickle our funny bone. I would definitely rate the movie between ‘Borat’ and slightly above ‘Bruno’. In this movie Sacha takes on the dictators as he plays the role of Admiral Hafaz Aladeen. ‘Admiral Aladeen’ is the dictator of the Uranium rich North African Nation of Wadiya. The movie has a promising start which talks about the dictator’s childhood. The movie starts with the news reader giving insight about the mounting tensions in Wadiya. Admiral had changed over 300 Wadiyan words to Aladeen including words such as ‘positive’ and ‘negative’. A doctor informs one of his patients that he was HIV Aladeen owing to which he gives mixed emotions of happiness and sorrow as he is confused. It also shows the birth of Baby Aladeen with his trademark beard and pubic hair. 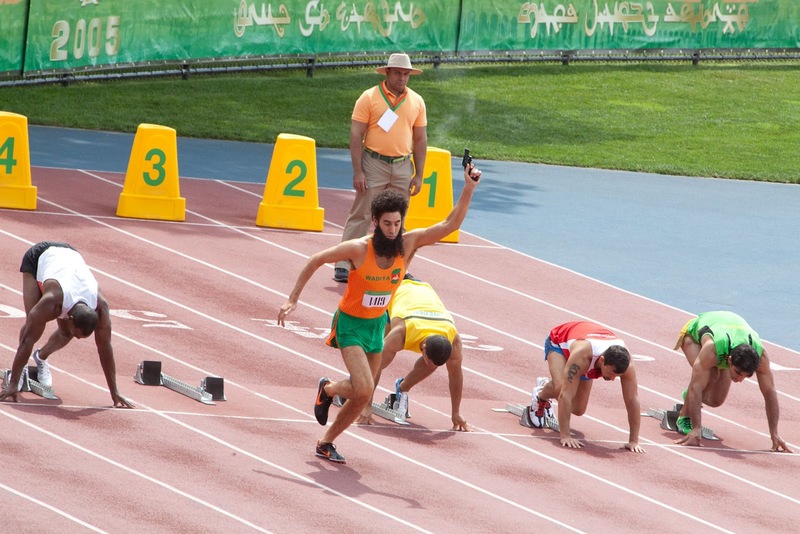 The Supreme Leader ‘Aladeen’ also organized his own Olympic games and claimed to have won 14 gold medals. 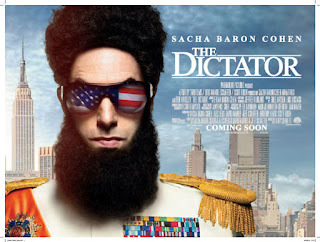 The movie is promising enough to make you laugh, thanks to DAN the MAN Sacha Baron Cohen aka ‘The Dictator’. The accent with which he speaks is amusing and his looks and behaviour resemble Late Mohd Gaddafi of Libya especially the female bodyguards. The film starts with a special dedication to North Korean dictator Late ‘Kim Jong II’. The Supreme leader delivers a speech while addressing the Wadiyan people and boasts about the uranium rich country and informs them about using those resources only for clean purposes like for medical and research and giggles. The world nations are worried about the dictator and they want him to address the United Nations. He expresses his desire to make his country a Nuclear power nation and comes hunting for his nuclear scientist ‘Nadal’. He argues about the shape of the missile with the nuclear scientist and wants the missile to be pointy. The dialogues are too hilarious especially between the scientist and the Admiral where the admiral claims to have seen a research which the scientist objects it to be a cartoon. The dictator wants him to be executed as the scientist disagrees with him. Ben Kingsley plays a crucial role in this film as ‘Tamir’ who is the dictator’s uncle and aide. The dictator is concerned about his life and has too many body doubles so that if someone tries to assassinate him the body double is killed. Tamir eyes the Uranium and wants to sell all those to his friends who are the head of other Asian and Middle Eastern countries. Tamir makes a plan and sets a trap for the admiral. Unfortunately the dictator falls prey to it. He uses the admirals body double who is mentally challenged (Efwadth) to address the UN.The security person shaves the ‘original’ admiral’s trademark beards. Helplessly he watches him and feels sad at his own plight. On the D-day, the admiral is supposed to address the UN and sign an agreement stating that Wadiya would soon turn into a Democratic country. The ‘original’ Admiral waits outside the Lancaster Building watching all the funny and weird actions by the ‘body double’ admiral.The body double aka Efwadth urinates on a jar and pours over the Israeli delegates as he is mentally retarded. The 'Original' Dictator yells ‘He is not the legitimate leader’ at Efwadth and the entire mob chant the same slogan. The ‘original’ dictator without beard objects the body double’s speech and doesn’t want democracy in Wadiya. He runs towards the building where he is beaten. During this event he encounters woman activist Zoey (Anna Farris) who offers him a job in her store. The dictator introduces himself as ‘Alison Burger’ to Zoey. He initially refuses the offer and moves on to NY’s ‘Little Wadiya’ which is populated by the Wadiyan refugees. There he encounters his nuclear scientist ‘Nuclear Nadal’ who works as Mac expert in an Apple store. Nadal explains that Wadiyan rebels infiltrated his intelligence unit, sending into exile all the people he had ordered to be killed. Nadal and Aladeen plan to destroy Tamir’s plot where the Nadal urges the dictator to make him as the head of the Wadiyan Nuclear Program. Aladeen(Alison) accepts Zoey’s offer as she is catering at the Lancaster Hotel where signing was supposed to take place. 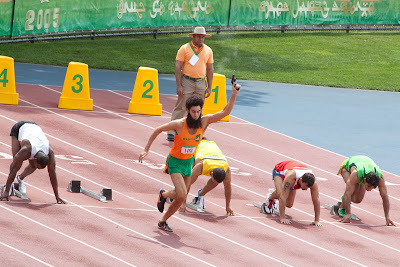 Both Nadal and Aladeen make a plan and unfortunately their plan fails to materialize. Aladeen (Alison) helps Zoey in improving her struggling business with his strict rules on employees and schedules.With the help of a beard taken from a corpse ,Aladeen infiltrates into the hotel where ‘Efwadth’,his body double lived.He incapacitates him and enters the signing ceremony.He tears of Tamirs document to form a democratic government and gives a speech praising the virtues of dictatorship and urges USA to move to dictatorship.His heart melts when he observes Zoey in the hotel and expresses his love to her. The dialogues which he uses to explain democracy are unusual and it is too good.He vows to democratize his nation and open oil fields for business but in a way where people will benefit.He also promises to hold fair elections in his country. The films will make you laugh like anything. Ana Faris has done a commendable job but the dictator takes away all the charm.I believe that Ben Kingsley should have been given more role but sadly its not the case. Larry Charles ,the director of the movie has proved himself once again. The child birth scene might look offensive to many of you.The helicopter scene is equally hilarious. Megan Fox does a cameo for the film.The following scene is funny where the admiral sticks his picture with Megan on the wall along with other celebrities where he is found semi naked with Hally Berry,Hillary Swan,Arnold Schwarzenegger etc. Some might feel this movie as offensive and some might think it as racist. 1.Aladeen- Megan, you were worth every penny. I trust everything is in there as your manager requested? Megan Fox- What’s this, a ruby? Is that a joke? What am I, a Kardashian? Aladeen- No, of course not. You’re much less hairy. 2.Hotel Manager- …I am here for your protection, but I have to say, I hate Arabs. Aladeen- I’m not an Arab. 3.Zoey – Alison, could you please take your hands off my breast. Aladeen (Alison) – Breasts??. I thought you were a boy. 4.Aladeen(Alison) - We love it when women go to school.Its like seeing a monkey on a roller skate .It means nothing to them but so adorable to us. 5.Aladeen - I am executing myself.I am nice.I am like mushroom,hard and fake from outside but soft and mushy from inside. I enjoyed the movie although I was expecting more as I am a very big fan of Sacha. I am not disappointed but I felt that it could be better. I give 2.5 stars out of 5.